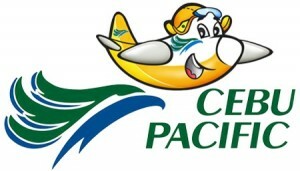 It was early this year when Cebu Pacific Air had this promo (thanks much!) I was unaware about it, but just got an SMS from my office friend that she actually booked me along with our other circle of office friends. The trip destination was Cebu via Davao since there is no direct flight from Cotabato City to Cebu. The total cost of round trip for each passenger was much cheaper than the regular fare! It was just so fun thinking 8 of us could travel together at last and it’s honestly my first time for a Cebu tour! Philippines has 3 main islands namely Luzon, Visayas and Mindanao. 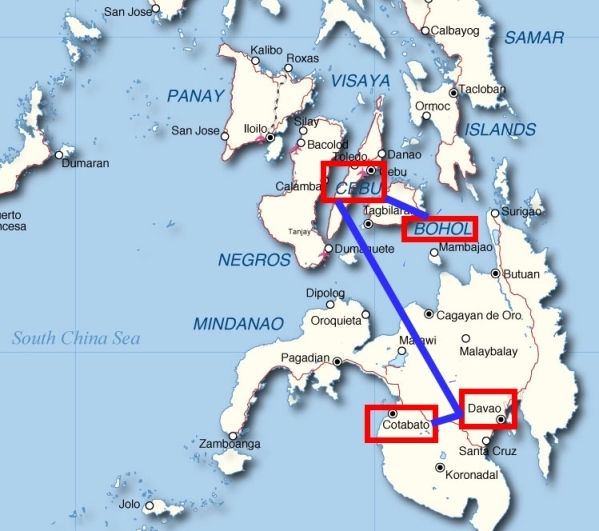 Our location is here at Mindanao and we’re going to Visayas. 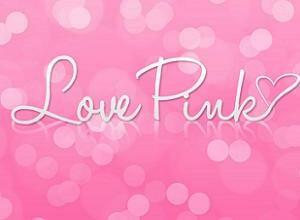 Yuhoo! The buying period was last February and the travel period was for the month of June. Finally, the much awaited trip happened last June 20-23, 2013. By early June, one by one we filed our leave of absences. It was a relief that we were from different departments because sure there’d be other office mates to look after our work responsibilities. By the way, instead of 8 only 7 of us left for the trip because by March the other one confirmed her pregnancy! There’ll always be next times anyway. Our departure date of June 20 (Thursday) was a local holiday here in Cotabato City because it’s our city’s foundation day, so we only had Friday to file for leave of absence. That’s how smart our friend who booked us was, haha. She just picked the perfect trip date. We were so excited by June 13, exactly a week before our travel. We had our own official meeting about our travel and a tentative itinerary of our trip was shown on a pdf file. We were praying for fine weather since it was raining hard that week and on some area were thunder storms and tornadoes too. But then, God heard our prayers! June 19 was a fine evening so we woke up to a bright morning of June 20. I was picked up by 6:15 since we are worried of traffic jams in case there’ll be Araw ng Kutabato activities in the streets. We were to meet each other at the van terminal bound for Davao by 6:30 am but were finally completed at the terminal by 7:25. We picked a van, settled our stuffs and ourselves then the official trip begins! Wuhoo! 7:50 am-Bye Cotabato City. We finally left the terminal. I was observing the driver and he looks calm so I felt safe and comfortable the whole trip. 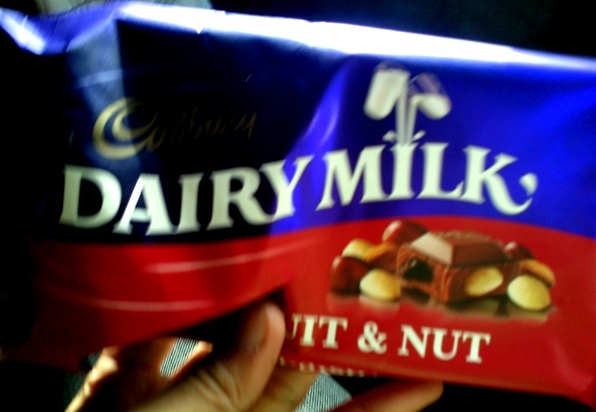 With this Cadburry Dairy Milk, the trip was much delightful! Since I was the youngest among the ladies, I got hold of it the longest time. 12:45 pm– We finally arrived at Davao City terminal which is just beside the SM Davao mall. Just so glad we could have our lunch because we were all soooo hungry! See, to have android Google map was actually extra fun on a trip like this. 1:00 pm – After their pee moments, we gazed among the different food court services and there were lots of them! Everything looks yummy. At first, I was looking at those fried fishes but I ordered chicken barbecue with, pansit, rice and water. I’m not much fan of soft drinks and juice. 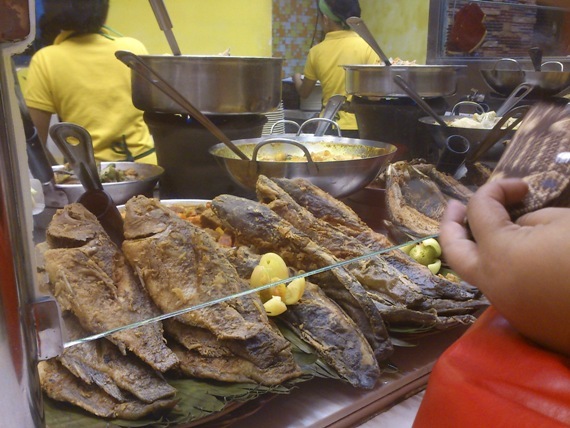 We enjoyed our yummylicious lunch at SM Mall Davao City food court! 1:40 – 3:00 pm – Since our flight has been moved from 3:40 to 6:40, we decided to just stay in the mall and meet each other at the baggage counter by 3:00 pm. We had all the time to roam, not much of shopping since we haven’t reach our main destinations yet. 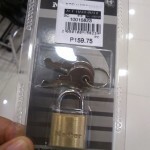 We went to Ace hardware to buy locks for our baggage. Keep everything safe! So you could hold the fork, spoon and knife altogether while eating. So you could pat the heads of your 3 dogs. 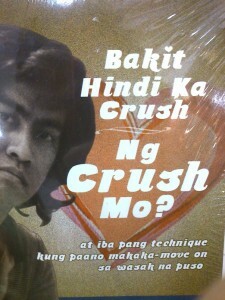 I saw another interesting book with the title, “Bakit ka hindi crush ng crush mo” or in English, why your crush doesn’t have crush on you. But since it was sealed, I never had the chance to read a single page of it. At least I was able to take a photo of the cover. We went to the ladies wear because one of my friend was looking for a nice tights. My friend bought cotton candies for me, I never said I wanted to, but she was looking at me when we passed by the cotton candy stall and suddenly she bought one for me- hahaha! Just how the time flies and we realized it’s almost 3 pm so we rushed to the baggage counter where we planned to meet each other. 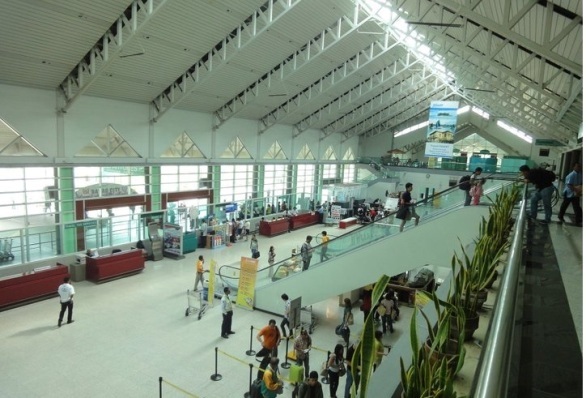 We took 2 taxis and went to the Francisco Bangoy International Airport (Davao International Airport ). 4:20 pm – We arrived 2 hours+ before our flight. It’s better early than late. We’ve checked in our luggage and decided to wait in the lounge area. 5:10 pm – We were in the lounge and believe me, we did nothing more but eat and eat. We wanted to have coffee so we checked on their cafe but we were shocked that an ordinary coffee that’s worth 7 pesos per sachet is worth 80.00 there! Oh my oh my just so expensive! We left and decided not to have coffee then. 6:40 pm – Welcome aboard! They were all concern since it’s my first time on an air trip. I’ve been to Luzon before but I and my Papa traveled by sea when we went to Manila. My friends were looking at me the whole time. I told them not to worry because I feel like just riding on a ferries wheel. The weather was so fine! 7:45 pm – Cebu here I come! 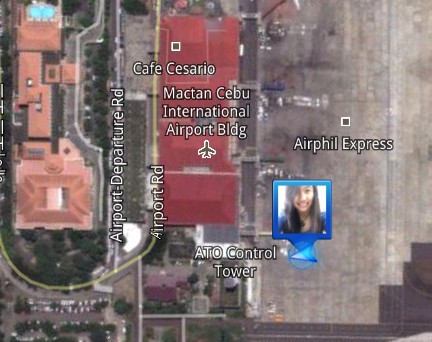 We landed at Mactan Cebu International Airport after an hour but it was already raining really hard. So we waited for the Cebu Pacific Air bus to fetch us. 8:30 pm – Yeah honestly it took them 45 minutes to fetch us from the plane. Just outside the airport, 2 friends of ate Helen were waiting for us. They booked us for our hotel so we are very much thankful for that. 9:10 pm – We were booked in a hotel which is a bit close to the airport, yes it was really close and it only took us 15 minutes (without traffic jams) and maybe would take 20-30 on busy traffic. 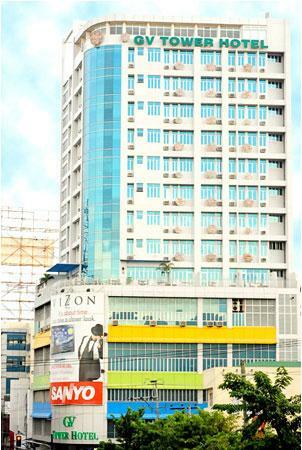 The hotel name was GV Tower Hotel and the entrance was like a drive-thru or basement that could accommodate only 2 cabs at the same time. We also saw the guards and a fish tank with Arwana fishes and some old and spooky photo frames. The guard said the reception is found on the 7th floor. Cool isn’t it? We took the elevator, dealt with the receptionist and our room is on the 5th floor. Due to the superficial beliefs, there is no 5th floor button in the elevator. So we needed to take the elevator down to the 6th floor then take the stairs down to the 5th floor. The narrow alley makes me feel like we’re shooting for a horror film! I also noticed that the other rooms don’t have lights on – in short, no one’s taking those rooms! Geeez! So we came in our Family room. We rested for a while and decided to go to their resto and dine. Sad to say, they are closed during midnight so we went out and searched for the closest food chain. 9:50 pm – Imagine dinner at 9:50 pm? 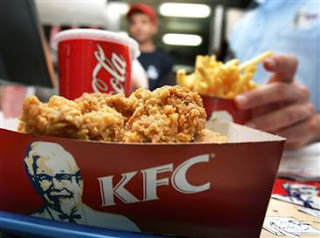 We’re just so happy to see KFC and on a walking distance. I ate a lot! 10:25 pm – We’re back at the spooky hotel (lol). Am not seeing other people except for 1 receptionist and 1 crew on their mini convenience store. Their restaurant looks like no one’s eating even during daytime. I was really wondering if there were other guests staying there aside from us. Looks haunted haha. Again, we settled our things and washed up. 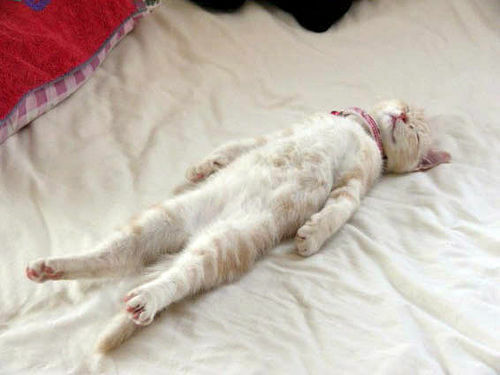 So tired, yet we couldn’t keep ourselves from laughing and sharing stories. There was a TV in our room but with limited cable channels. But, BIG BUT! We needed to turn the TV off because there’s only 2 outlets. Yeah how are we (7 people) able to charge our cellphones and gadgets with only 2 outlets. That’s a total turn off for that hotel. 11:45 pm – It’s when I noticed them being quiet already. So I dropped my phone and went to sleep since the next day is going to be a very busy one. Goodnight and sleep tight!